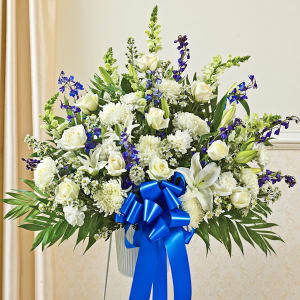 Hand Delivery on all Arrangements by a Local Florist! Convey your deepest condolences at this sorrowful time with a touching tribute. • Our florists arrange beautiful blue and white flowers such as roses, hybrid lilies, snapdragons, delphinium and more. • Traditionally sent by family, friends or business associates. • Sent directly to the funeral home. 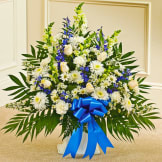 Flowers will be received by a Deisler Funeral Home's staff. They were beautiful. Thank you so much especially in the time frame! 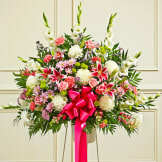 Donna H.
All of our flowers are designed and delivered by hand from a local florist in in Saginaw.